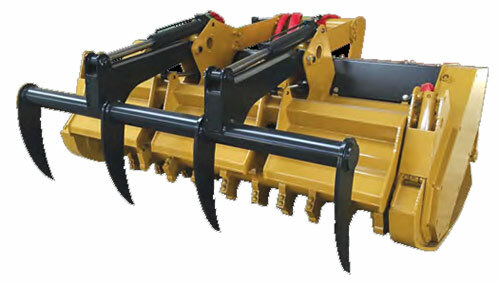 Combination - Stone Crusher, Wood Mulcher and Deep Tiller. 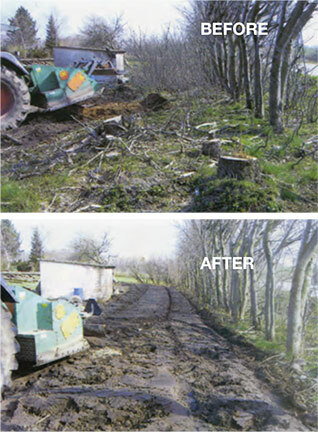 For Felling & Mulching Trees / Brush & Stumps and Crushing Rocks & Soil. New dirt road building and re-juvenation. 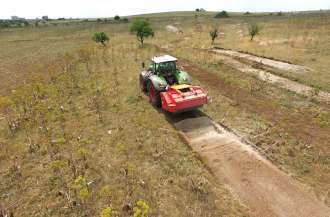 Shown with optional compacting roller. 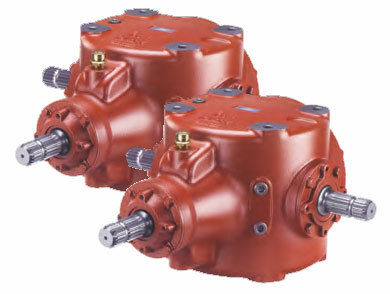 Each RotoCrusher® D ships with an extra gearbox which allows you the choice of 340rpm or 600rpm rotor speeds. 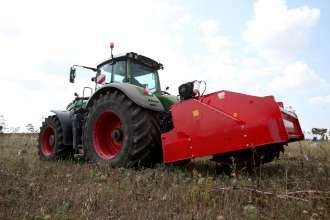 Shown with optional hydraulic levelling blade. Can mulch wood up to 30cm/12″ dia. 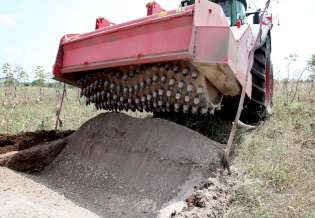 and crush stones up to 25cm/10″. Rejuvenate gravel roads and shoulders without trucking in new material. Tungsten Carbide ‘BlonXXTM’ tips arranged in a unique spiral pattern for maximum crushing efficiency. 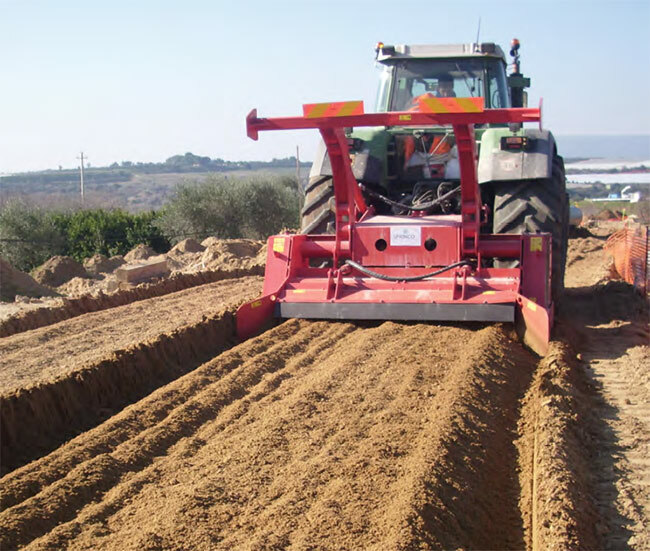 Reclaim soil from unused orchards and vineyards. Each RotoCrusher® D ships with an extra Bondioli & Pavesi gearbox which allows you the option of 340rpm or 600rpm rotor speeds. 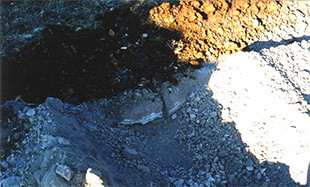 Slower rotor speeds are more effective for crushing rocks. 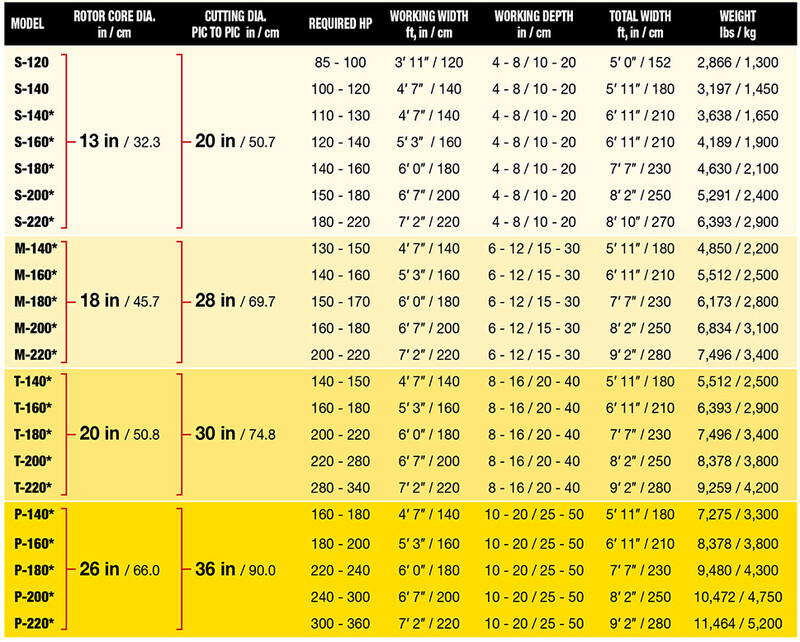 Faster rotor speeds are better for stumps and wood. 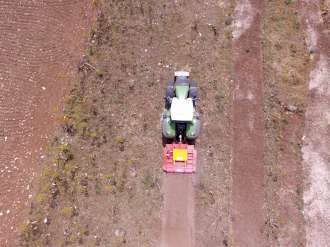 The RotoCrusher® D is the ideal machine for opening up new land, removing stumps, crushing stones, removing old orchards or vineyards, mulching up slash from forestry operations, clearing land for pipelines, firebreaks etc. 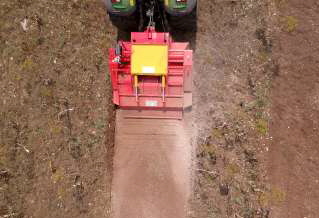 The RotoCrusher® D can mulch wood and stumps up to 30cm/12″ dia., crush stones up to 25cm/10″ and work everything into the soil to a depth of 20cm/8″ on the first pass, and up to 40cm/16″ deep on the second pass. 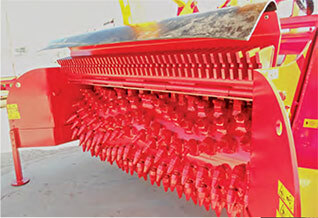 The rotor consists of Tungsten Carbide ‘BlonXXTM’ tips arranged in a unique spiral pattern that work against a hydraulic adjustable serrated steel ‘grate’ to reduce to mulch virtually any material that it encounters. 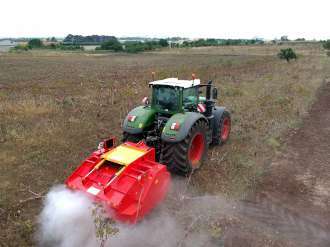 Options includes a hydraulically controlled full length, curved levelling blade (or roller) / tree guard frame that provides a dual function. 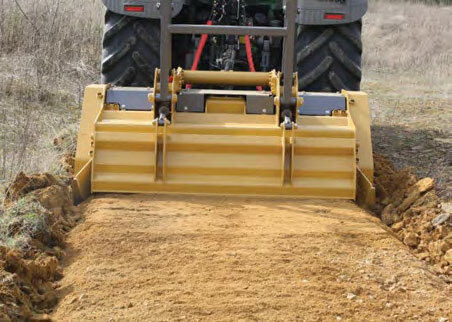 When positioned up it acts as a guard frame / tree pusher and when positioned down it functions as a land levelling / compacting roller that also controls the depth the Roto Crusher will work into the ground. 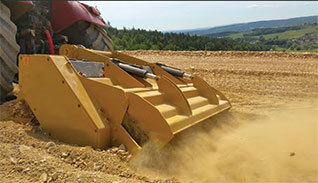 RotoCrusher® D is available in widths from 1.2 m to 2.2 m (3'11" to 7'2") requiring tractors with 85 hp to 400 hp. 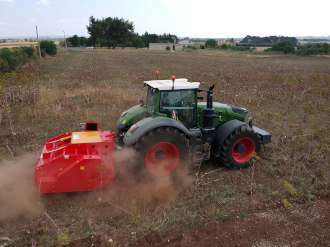 CVT tractor recommended. 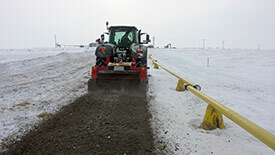 Roto Crusher grinding off frozen layer of soil to prepare for trenching and laying of pipe. Adjustable grate made of HARDOX® steel is built in to the underside of rear door. Allows operator to determine the size of the finished product. 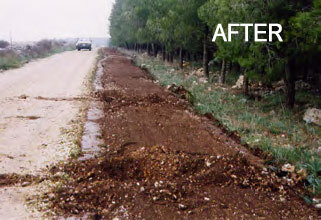 Rejuvenate dirt and gravel roads at a fraction of the cost. 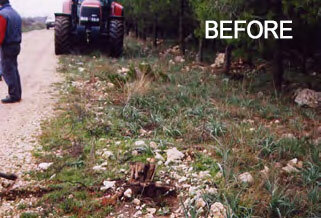 Maximize farmland by reclaiming rocky, overgrown and previously unusable areas. 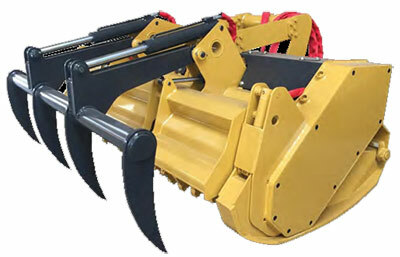 Unlike some competing rock crushers that use expensive square carbide hammers originaly designed for forestry mulchers, the Roto Crusher Super Mulcher "Deep" uses Blonxx tungsten carbide pics that are readily available from several sources, are long lasting and economical. 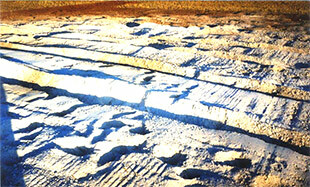 Blonxx pics were developed decades ago for use in the underground mining industry, and are widely used today in rock mining and on asphalt & concrete stripping machines. 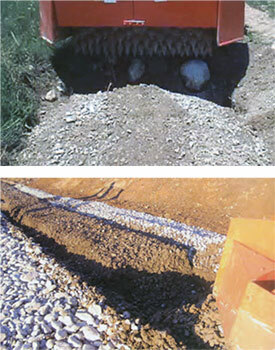 Blonx pics are the most economical type of wear parts for rock crushers at present. 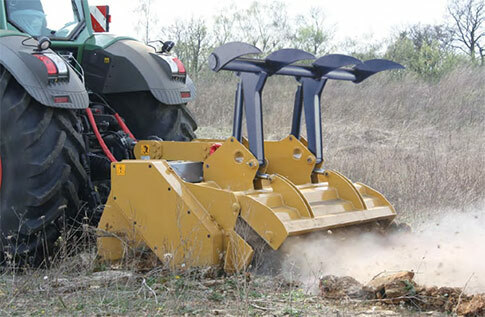 For Felling & Mulching Trees/Brush & Stumps and Crushing Rocks & Soil. 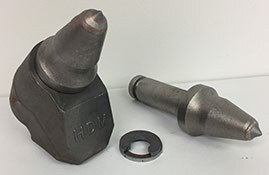 Spec's listed are for a machine that has 25mm "medium" carbide BlonXXTM tips. *Double side transmission. * The weight of the machines is approximate, it refers to the standard version with any options and it may vary. right to make changes without notification. 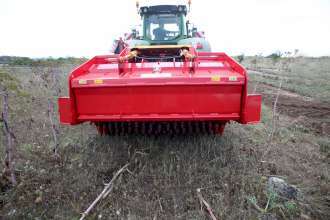 Shown with optional hydraulic tree guard/brush rake. 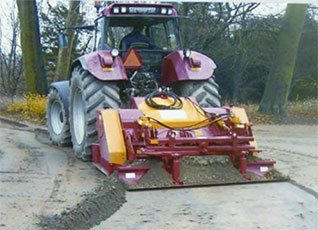 Optional: Full Length compacting hydraulic rear roller. Each RotoCrusher® Super MulcherTM ships with an extra gearbox which allows you the choice of 600rpm or 1425rpm rotor speeds. Can fell and mulch standing trees up to 30cm/12″ dia. 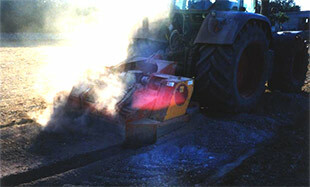 & crush stones up to 25cm/10″ dia. conditioning soil in one easy step. 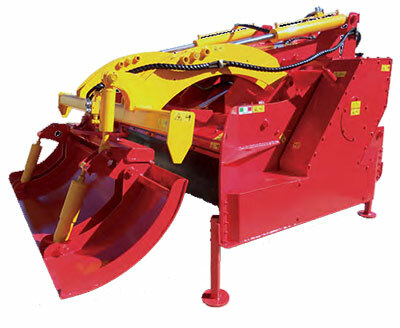 Each RotoCrusher® Super MulcherTM ships with an extra Bondioli & Pavesi 2200 gearbox which allows you the option of 600rpm or 1100rpm rotor speeds. 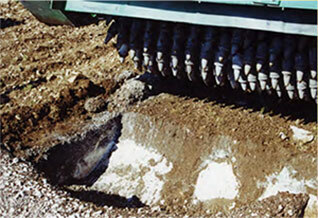 Slower rotor speeds are more effective for crushing rocks and grinding stumps below grade. 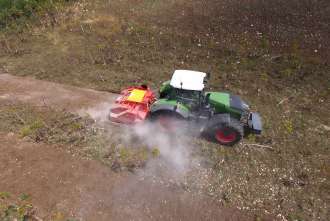 Faster rotor speeds are better for felling trees and mulching above grade. The rotor consists of Tungsten Carbide hammers arranged in a unique spiral pattern that work against serrated HARDOX® 450 counter knives which enables material to be broken down. Dual side transmission with heavy duty toothed polybelts. 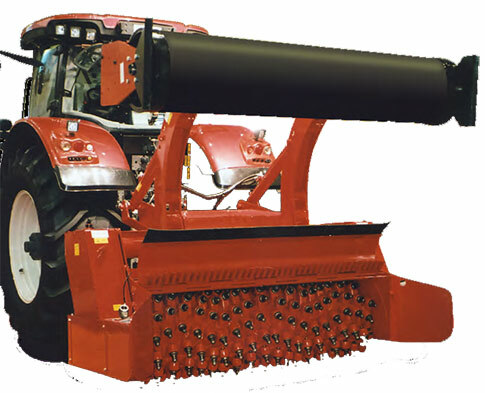 Options include a hydraulically controlled full length, tree guard/brush rake. RotoCrusher® Super MulcherTM is available in two widths 220 cm and 240 cm (7'3" to 7'11") requiring tractors with 220 hp to 400 hp. 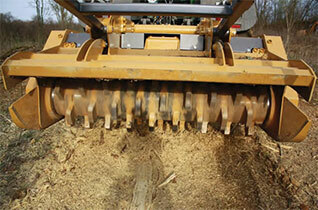 The RotoCrusher® Super MulcherTM can mulch wood and stumps up to 30cm/12″ dia., crush stones up to 25cm/10″. Felling standing trees up to 30cm / 12" in dia.